Matthew was the son of Rev. William and Charlotte Wright. Matthew Wright was born on 23rd. February 1888. The family lived in Newtownards. Matthew was in the employment of Messrs John Stevenson Ltd, Coalisland for a time. Prior to enlisting, he was a cashier. He enlisted in the 14th Royal Irish Rifles (the Young Citizen Volunteers). He was commissioned as a Second Lieutenant in January 1915. 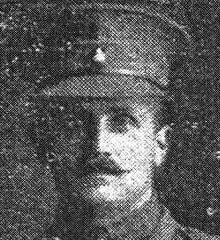 Second Lieutenant Matthew Wright was the 14th Battalion of the Royal Irish Rifles when he was killed in action at the Somme on 1st July 1916. After the war a small headstone was placed in Thiepval Wood in memory of him. It is now in the Ulster Tower for safekeeping. The Masonic Lodge in Newtownards was renamed in memory of 2nd Lieut. Matthew Wright.